DB's latest analysis confirms that US housing price stabilization is now taking place (as predicted here back in January) as inventories continue to decline. The chart below shows the ratio of homes for sale to the total number of households. 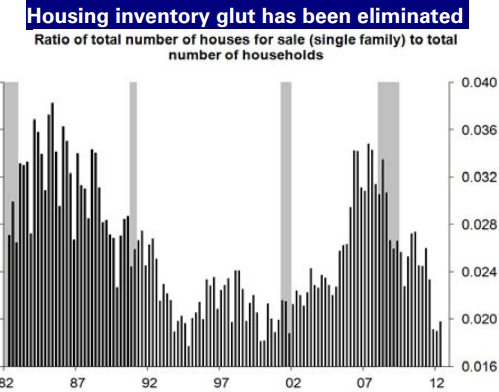 DB: - Much of the economic data has taken a turn for the worse over the past few months, but the housing sector data has largely proved resilient in the face of a sputtering labor market and mounting economic uncertainty. The housing sector fell into decline sooner than the broader economy ahead of the 2007-2009 recession, and it took longer to regain traction. However, our analysis indicates that the excesses of the “housing boom” have been largely eliminated, whereby a lasting recovery can proceed so long as overall economic momentum and income growth are not disrupted in any meaningful way. The fact remains that new home construction is proceeding at half the rate it should be to keep up with growth in the number of households. 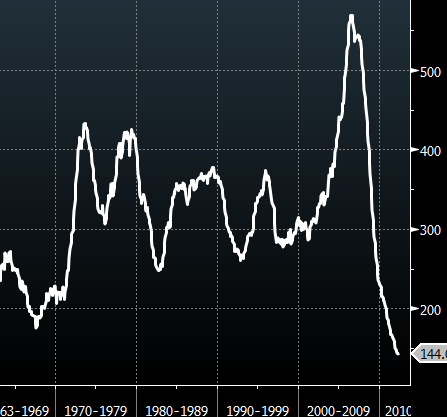 The inventory of new homes is now at the lowest level since this data series was started back in 1963. Again it is important to point out that this improvement in the US housing market is a result of falling supply due to demographics rather than improved demand driven by the economy. And certainly rising rents coinciding with rapidly declining mortgage rates (affordability) make the choice to buy a home that much easier.